- Improve database restore, now is compatible whit more cPanel backups, fix some bugs when database dont have Grant ALL Privileges. - Improve database privileges restauration, now only was restored real database privileges, skip cPanel main user privileges, and a lot of grant all privileges added by cPanel when account was migrated to orther server. - Some bugs was fixed. - Bugs fixed, bad permisions on some files after restore. - Improve some functions, get real cPanel user. - Dont restore database if is already created. - Add file count to show user some progress when extract backup and restore domain files. Hope help some body, am not a programer, so this may have bugs, you can report any troble on this post and I try fix it or help when have some time. Last edited by skamasle on Fri Mar 17, 2017 2:14 pm, edited 29 times in total. You should add the restoration of mail. To me thats important and one of the hardest things to do when moving from cpanel. Files and db is easy! leisegang wrote: You should add the restoration of mail. To me thats important and one of the hardest things to do when moving from cpanel. I do some test and backup converter is easyest than a direct importer, so convert backup to vestacp style and then restore is more easy to get mails working. i think that a import of a "full" backup is easier than a "direct transfer" in the WHM panel. Also transferring a zip file with wget is easy. And the import i guess will be a v-import-account type of script in CLI or are you adding a web interface? I take a closer look to mails, and I can say than is easier restore mails from cpanel than restore databases, databases need a lot of work for get it working 100% and 100% compatible. leisegang wrote: i think that a import of a "full" backup is easier than a "direct transfer" in the WHM panel. 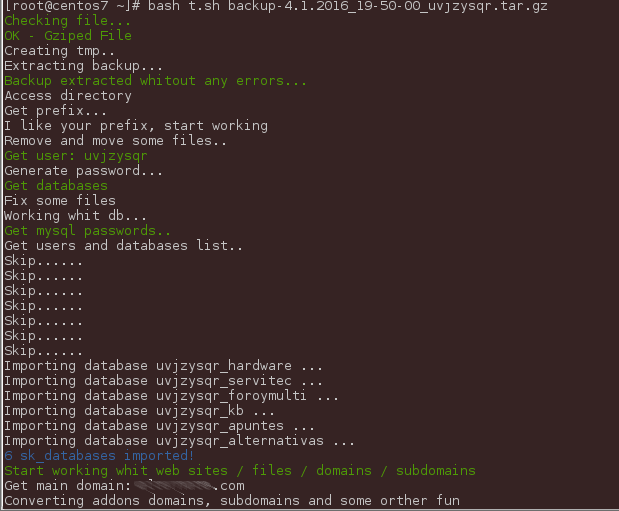 Am working on cli only, script take an argument ( path to backup file ) and restore it. Last edited by skamasle on Sat Apr 02, 2016 10:22 pm, edited 1 time in total. Would like to test also. I add some information on first post. I work slowly on this, Im not a programer and dont have much time, and I not get beta testers. You can count me in to test.